In January, IYF welcomed Sheldon Smith to our board of directors. Smith is the founder and director of The Dovetail Project, a Chicago-based organization that, since 2010, has provided training, education, services, and support to young African-American men to help them be “better fathers for their children and better men in their communities.” A 2011 Laureate Global Fellow, Smith has received numerous honors and awards for the work he does with Dovetail, including being among the Top 10 CNN Heroes of 2016 and Forbes magazine’s 2018 30 Under 30 for social entrepreneurs. According to Smith, though, the greatest honor comes from hearing the inspirational success stories of the 337 who have graduated from The Dovetail Project. Below, Smith elaborates on the work being done by Dovetail to strengthen relationships between fathers and children, challenge stereotypes, and change the negative narrative about young black men—especially fathers—in Chicago and elsewhere. Describe briefly what The Dovetail Project is, what it does, and who it serves. The Dovetail Project serves one of the most vulnerable populations in the city of Chicago—young African-American fathers, ages 17 to 24, who live on the South and West Sides of the city. The Dovetail Project’s core program is a 12-week curriculum-based series of fatherhood workshops that address parenting skills, life skills, and educational and career pathways. Fathers learn about the roles, rights, and responsibilities of fatherhood, and about their importance in the lives of their children. Participants receive a stipend, meals, and bus fare; educational opportunities such as GED examinations and/or community college enrollment; and job readiness skills such as resume/interview preparation and trade/career counseling. We also educate them on felony street law so they can avoid incarceration. Guest speakers from various industries and specialties visit classes frequently. At the conclusion of the program, participants are honored with a graduation ceremony attended by their families. Then, they go on to maintain a supportive, active presence in their children’s lives. What inspired you to start Dovetail? At the age of 20, in 2009, I became a father to a beautiful baby girl. I wanted to be a great father and began searching for resources to help me accomplish that goal, but I became disheartened by the lack of services and support available in my community. I turned my frustration into action, and then I turned my action into my organization. 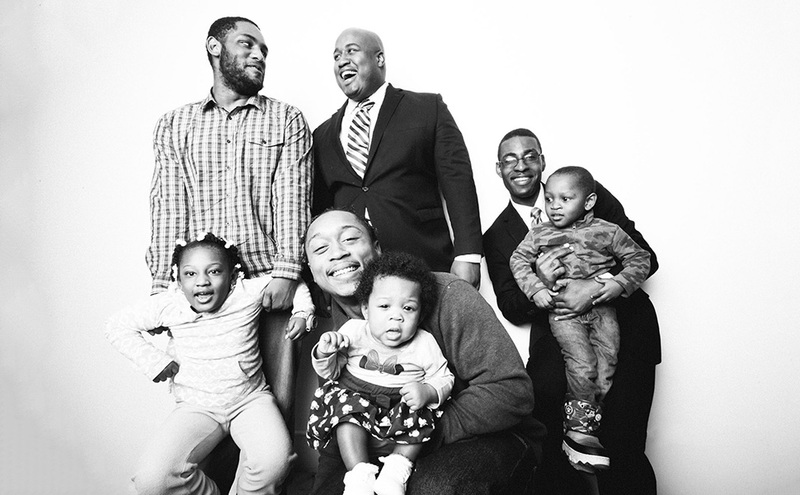 As a community organizer since the age of 13, I knew how to bring people together, so I started the Dovetail Project, to provide resources to my fellow young fathers looking to build lasting relationships with their children and families. How do your student-fathers learn about the project? We employ a team of outreach workers who go into the communities we serve and speak to the young men and community members about our work and its impact. Often these workers are alumni of the program who can speak about their own personal experiences and how the Dovetail Project has helped them succeed. They can connect to prospective students at a peer-to-peer level and reach out to those who are normally hesitant to seek support. We also advertise in various businesses, public transportation, and social media. How is Dovetail changing the narrative around fatherhood? There are so many negative images and beliefs about young black men in Chicago and about black fathers in general. There is a documented lack of opportunity for young black men (for example, a University of Illinois at Chicago study showed that half of all young black men in the city were out of both work and school in 2014) but this does NOT mean that young black men do not care about their responsibilities as fathers. Our students change the narrative by showing young black men who are committed to being great fathers to their children and upstanding members of their communities. All our students view fatherhood as important to them when they enter the program (already disproving stereotypes that young black men do not care about their children!) but many lack relationships with their own fathers, so we provide the knowledge, resources, and support that they need to be present, to be a provider, and to be a parent. Who benefits when a young man learns to be a better father? The most important people who benefit are the children. Research shows that having an involved father increases children’s success in school and reduces the risk of their committing crime. It elevates their confidence and sense of self-worth and increases their mental and emotional health. Simply put, when fathers are involved in their children’s lives, their children do better. But the whole community also benefits because these young men become positive role models, contribute to the community, and create successful youth. In your experience, what does it mean to be a “better father”? Being a “better father” means being a consistent, providing presence in the life of your child. This lays the foundation for having a strong and loving relationship with your child. This may vary between different people and contexts, but the pillars are the same: be present, be a provider, be a parent. There are some fathers who provide for their children, but they aren't involved in their lives, which helps families financially, but still ultimately has a negative impact on the children and the family structure. Children need reliability. They need a father who will listen to them and reach out to them. They need to know their father will be there to support them, to love them, and take care of them. A “better father” both provides and is present. The Dovetail Project has accomplished a lot since 2009. What are your plans for the future? I would like to expand the Dovetail Project to other cities around the country to support fathers in underserved communities who would benefit from our program. I would like to expand the organization to serve Latino fathers as well as black fathers. Fatherhood matters in every community, in every city. Since the program’s founding, leaders in various cities around the Midwest and all over the country have come to me and said, “We need the Dovetail Project to expand to our city!” My ultimate dream is to make that expansion happen, so more children around the country can grow up with their fathers in their lives. What advice would you give a young man who, perhaps unexpectedly, becomes a father? Everyone can be a great dad with the proper support, resources, and effort. Fatherhood doesn't come with a road map or a manual, but you can get the help you need even if your own father can’t provide it. There will be hard days, but you can get through them. Keep showing up for your child. You are not alone – there are so many other young men just like you who want to be great dads. Find each other and support each other. Never doubt your importance in the life of your child, and never let anyone keep you from being a great father. What excites you about joining the IYF board, and what do you hope to accomplish? In 2011, I was selected to be a YouthActionNet® Fellow. It was one of my most memorable experiences because of how much I learned and grew during that time. At that time, I was new to running my organization, and the seeds for much of what I have learned since then were planted by my IYF fellowship. I will never forget connecting with fellow youth leaders from all over the world, and I am excited to support the next generation of youth leaders as a board member. I am looking forward to working with fellow board members to build upon the success of IYF by bringing new and innovative ideas to engage and educate youth. I am also looking forward to being part of an organization that has extensive experience in scaling and replication to gain new insights for the Dovetail Project.